Bring out her wild side in this tween tigress costume! The black tank style dress has a ruffled skirt accented with tiger print ruffles and white trim. It has Velcro clasps in the back as well as ties at the waist to secure it. A tiger tail is attached in the back with Velcro. The crop length hoodie has long sleeves and features the same tiger print as the skirt. It zips in the front and is embellished with ears on the hood and paws at the end of the sleeves. A pair of matching tiger print leg warmers is also included. 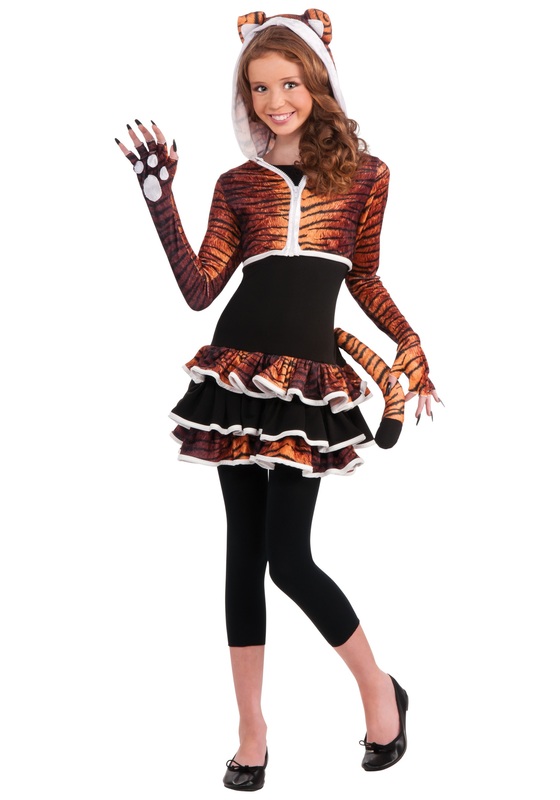 She'll be the sweetest tiger anyone has ever seen in this cute costume for tweens!